New Forest cycling provides a wonderful experience that can be appreciated by young and not so young, alike. Travel at leisurely pace through some of the best countryside in England, absorb the very special atmosphere of this historic landscape, and enjoy a little exercise as well! What could be better? New Forest cycling can be enjoyed by all, almost regardless of fitness levels, using a specially provided network of cycle routes that extend for more than 160 kilometres (100 miles) over usually dry, compacted, off-road tracks and minor roads - use by forestry vehicles can, though, sometimes result in surface mud gathering on the tracks. New Forest cycle rides are great for families, too. All the cycle routes are signposted, and, as most are off-road, cyclists with young children can enjoy the peace and quiet of the countryside without the noise, and risk to life and limb, posed by speeding cars. A number of suggested, mostly circular New Forest cycle rides of varying length are included here. All start in Forestry Commission car parks or locations where roadside parking is available apart, that is, from the Beaulieu to Buckler's Hard ride that starts in Beaulieu village. Many are also readily accessible from other local villages, cycle hire businesses and the railway stations at Ashurst, Beaulieu Road, Brockenhurst and Sway. And from late June to early / mid-September, cyclists may also wish to try the New Forest Tour Bus, on which cycles can be carried - details of the tour bus route, times and fares are here. Some of the suggested New Forest cycle rides cross open heathland, yellow with springtime gorse, then purple with summer heather; whilst all pass through magnificent, mature woodlands - but not just ordinary woodlands. Some are ancient, unenclosed pasture woods, open to grazing by deer, ponies and cattle. Others were planted up to 300 years ago, originally to provide timber for Navy ships. With each set of New Forest cycle ride details, information is provided about points of interest along the way - to help provide a context for the ride and also to increase the overall enjoyment of cycling in the New Forest. A map showing the complete network of New Forest cycle routes is available on the Forestry Commission website, but it's advisable, however, and probably better to also have access to an up-to-date copy of the Ordnance Survey map of the area - it's Explorer OL22 (the Weatherproof version is particularly useful) - which shows all the cycle routes, covers a far wider area and contains considerably more detail than the cycle map. Please be aware, though, that to help protect valuable wildlife habitats and the species that depend on them, cycling on the Crown Lands of the New Forest is restricted to the way-marked cycle routes. Indeed, cyclists contravening this local by-law risk a fine of up to £500. Take all litter home. It is unsightly and can also have unfortunate consequences for wild animals and stock. Do not be tempted to pick wild flowers (or anything else). It potentially damages the ecology of the New Forest, harms the individual species and is often illegal, too. Do not feed the ponies or other stock animals. It is bad for their diet, attracts them to roadsides and car parks where traffic accidents are always a risk, and encourages nuisance begging. And do close gates behind you. To create conditions where wild flowers flourish, stock are deliberately excluded from many of the woodland inclosures, and deer also from some. Open gates are an invitation that few animals can resist. Stock, primarily ponies, are, however, encouraged to enter a small number of inclosures - for example, Burley Old and Dames Slough - so as to introduce something of the character of unenclosed woodland into these places. Gates here are accordingly locked open. Please leave them as you find them. Note: Occasionally, public access is not available to some areas of the New Forest whilst thinning or other Forestry Commission management work is underway. Then cycle routes and walking trails are closed for short periods for the safety of both visitors and workers - details are here. Similarly, to reduce surface damage, a small number of car parks are closed, primarily in winter - details are here. 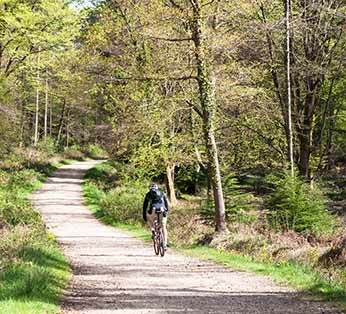 Those who enjoy off road cycling in the New Forest will appreciate a series of innovative Ordnance Survey Activity Maps that provide guides to off road cycling around Petersfield (East Hampshire), Alton (North Hampshire), Winchester (West Hampshire) and the New Forest (South Hampshire). Saturday, 2nd - Lyndhurst Community Centre, Book Fair, 10.00 - 4.00pm. Wednesday, 6th - Brockenhurst Village Hall, John Adams concert, 7.00pm - 10.00pm. Saturday, 23rd - St Barbe Museum and Art Gallery, Lymington, Welcome Spring, 2.30pm - 4.00pm. Sunday, 24th - Lyndhurst Community Centre, Holistic Health and Vegan Fair, 11.00am - 4.00pm. Sunday, 7th April to Wednesday, 29th May - Exbury Gardens, Four Seasons Art Exhibition, 10.00am - 5.30pm. Friday, 12th - Brockenhurst Village Hall, Film night, The Wife (15), 7.00pm - 10.30pm. Saturday, 20th and Sunday, 21st - Burley Village Hall, Craft Fayre, 10.30am - 5.00pm. For further details, view the full New Forest What's on programme.